Fall 2014 Note: Frosty shakes are off the menu! Yes, time for another wacky holiday that doesn't really have any proof of existence, yet can be found pretty much everywhere. Kinda funny how that works, but let's be honest, are you going to turn down an excuse to go stop for a Chocolate Milkshake? I think not. 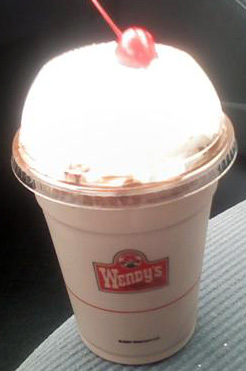 Update: Ok, I know it's not a real milkshake, but I had to grab something from Staples and there is a Wendy's across the street, so I finally tried a Frosty Shake (chocolate ofcourse). It's still thick, but not quite as thick as a frosty. Be warned, this does not taste like a regular frosty. It took many sips to figure it out, but basically this thing tastes like a giant Jell-O pudding snack (the chocolate ones with the cream topping). I opted for the small but wound up finishing it it no time, guess I should have went large. So they are decent, but I can't imagine getting an urge to run out and buy one anytime soon.